MSR Carbon Reflex 2 Tent. Now even lighter, the non-freestanding Carbon Reflex™ 2 backpacking tent is designed for adventurers who like to travel ultralight but want more protection than a tarp can offer. Built for two, the tent delivers the full protection, durability and simple setup of a tent with a minimum weight of .84 (1 lb 13 oz). Carbon fiber poles, lightweight fabrics and zipper-free vestibules make the tent weigh as little as a tarp and pack up just as small. It won’t weigh you down, whether you’re route finding in the Rockies, or losing yourself in old-growth rainforests of the Pacific Northwest. Twin doors, a spacious interior, and roomy vestibules make life on the trail more comfortable. 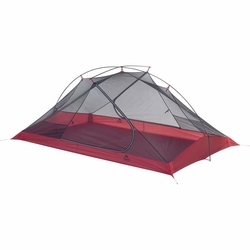 Ultralight: Lightweight fabrics, Easton® carbon fiber poles, and a zipper-free vestibule minimize weight.